Practicing our Philosophy of "Showing Up"
Our Customer Service Manager, Ellen (who also serves as President of our non-profit Fair Indigo Foundation), and Co-Founder, Bill, visited our production partners in Peru. Every returning trip strengthens relationships, widens smiles and drives us to continue working to make the clothing business a little kinder. Here are a couple highlights from their trip. Always an incredible stop, Ellen and Bill visited the Foundation’s adopted school, Serapis. At the school there are currently 46 students (plus 3 dogs and 2 roosters) ranging in age from 3-12 years old with a staff of five teachers, one doubling as the principal. David Condor Raico teaches 11 students in third and fourth grade. 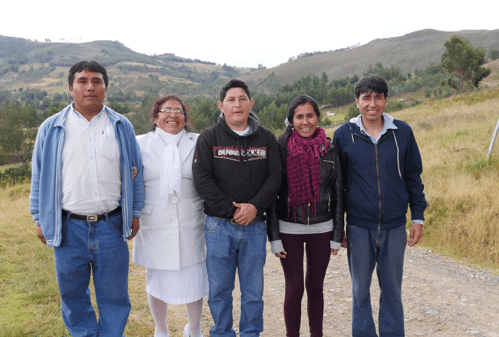 Maria Esperanza Songay Huaccha teaches 11 students but in first and second grade. She also teaches local traditional dance! Luis Suxe Suarez is responsible for teaching 10 students in fifth and sixth grade. Maria Angelita Diaz Ruiz teaches 14 students in Kindergarten. Gabriel Terrones Vilela is the director (principal) of the school and also teaches English and Computer Skills. During their visit to the school, the students put on a show of traditional music and dance, donning their best attire for the visitors. The communities surrounding the school have intense pride in their heritage; cultural preservation is a core subject taught at the school. After the 6th grade, students can attend secondary school at the San Juan Bautista School in Llacanora, an hour walk from Serapis. Parents, siblings, grandparents, and neighbors were all in attendance and helped prepare a traditional noon meal for Ellen and Bill, along with Javier and Elsa, the owners of our apparel workshop. Later that day after lunch, Ellen and Bill also visited a technical school in the town of Polloc. 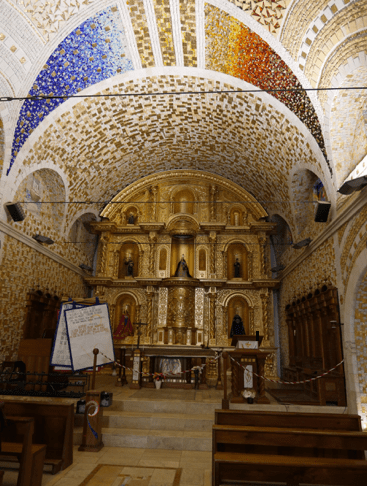 The school resides in a stunning building – a restored former church – the Don Bosco. Gabriel, the school principal, led the way on his dirt bike. It took a few treacherous roads and hairpin curves to get there, but it was worth the ride! The church and adjacent boarding school were converted by an Italian non-governmental organization in 1979 as part of a cooperative established to provide training and job opportunities in poor rural communities. About 25 students are admitted to the free, 5-year school each year. In addition to classes in core curriculum, they learn to paint and work with glass, wood, metal, and stone. Once trained, artisans earn a wage according to the number of pieces they finish per month. 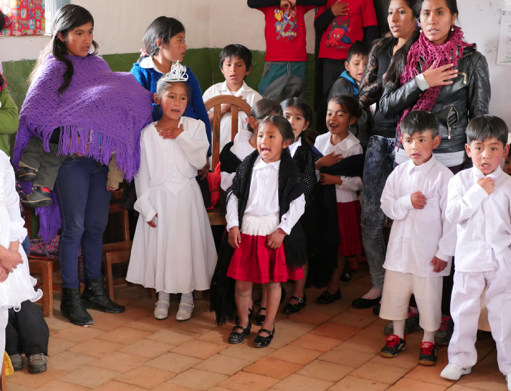 Churches in Peru, Italy, and the United States have commissioned work from the co-op.